ASHLEY SMITH • TIMES-NEWS Mulu Ghebrekidan, a refugee from Eritrea, holds a diploma he recieved from the University of Asmara for a biology degree he has from 2004. TWIN FALLS • Before resettling in Twin Falls, Mulu Ghebrekidan worked as a physics and math teacher for six years in an Ethiopian refugee camp. Instead, in Twin Falls he worked the eight-hour graveyard shift at Lamb Weston — a physically demanding job that took a lot of adjustment for him. 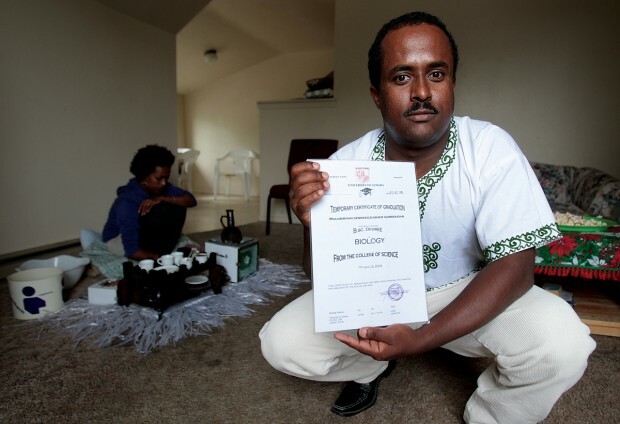 Ghebrekidan is one of hundreds of refugees who arrived in Twin Falls in the last decade. Though he went to college and has teaching experience, his degree and credentials aren’t valid in Idaho. Ghebrekidan isn’t alone. Most refugees who come with higher education and established careers don’t have credentials required for putting their experience to work. The result: Untapped potential for skilled employees in the Magic Valley. The hundreds of refugees who arrived in TwinFalls have come with a wide range of education, said Michelle Pospichal, former match grant coordinator for the College of SouthernIdaho Refugee Center. Some, like Ghebrekidan, have degrees, or have decades of career experience. Others had no access to primary education and are illiterate in their own languages. While the educated are more likely to speak English, they’re still only qualified for low-paying jobs for the first several years they’re in the United States. Ghebrekidan earned a bachelor’s degree in biology from the University of Asmara in Eritrea, right before fleeing the country to avoid obligatory military service in a conflict he didn’t support. But universities in Eritrea don’t give graduates official copies of their diplomas unless they’ve completed five years of forced government service. The only proof Ghebrekidan has of his work in college is a “Temporary Certificate of Graduation,”a print-out composed with WordArt in Microsoft Word. When he left Eritrea, he brought along his certificate, but that doesn’t count as proof of his degree. He now works the night shift at SL Start, a program for children and adults with developmental disabilities, and takes classes at College of SouthernIdaho during the day. Eventually, he hopes to enter the college’s nursing program, then transfer to a medical school where he can study to become a general practitioner. Even though Ghebrekidan’s diploma is useless in theUnited States, it prevents him from receiving certain types of federal financial aid available only to students who don’t have degrees. So Ghebrekidan is stuck with a useless diploma, no proof of the credits he earned and an inability to receive PellGrants. “It’s almost you’re better off if you had some college, but not a degree, because then you at least qualify for a Pell Grant,”said Edit Szanto, vice president of Student Services at College of SouthernIdaho. Refugees didn’t voluntarily leave their countries to seek a new life, Pospichal pointed out. Though they’re grateful for the safety and new life the United States provides, some still struggle with homesickness and grief over the lives they left behind. For those with higher educations, that frustration and identity crisis is often amplified. Other states offer bridges between trained refugees and careers. Illinois, California and New York participate in a program called Careers forNew Americans, which matches up highly skilled refugees, asylees and permanent residents with information on how to receive an occupational license. The nonprofit program Welcome Back Initiative provides similar information and counseling services for immigrants and refugees who are trained in medical fields. Currently, the services aren’t available inIdaho. Dawn Hall of theBureau of Occupational Licenses said there aren’t short-cuts for refugees. “Immigrants from other counties would have to meet the same set of minimum standards as any other person applying for licensure,”she wrote in an email to theTimes-News. “Similar to a person who has been licensed in a profession in another state, the immigrant would have to show proof of the education and training they had in their native country. “If that education and training doesn’t meet the minimum standards, they may need to have additional training, experience or an examination, based upon the requirements of the Board they are applying under,”she said. Some careers transfer more easily than others. Math and physics are the same no matter what country you’re in. But refugees who were lawyers in their home countries aren’t able to transfer any of their education to the United States, as each country’s legal code is different. For them, being uprooted usually means the end of their career. Here, individual college advisors can help new arrivals navigate the maze of paperwork and training required to regain their careers. Szanto works with prospective students at the College ofSouthernIdaho, including refugees who hope to enroll in credit courses. Those students face a number of potential hurdles. Some, like Ghebrekidan, come without official documents to prove their background. Others come with no documents at all, or had their education interrupted by conflict or resettlement. It’s a familiar story for Szanto. “Ican completely relate when the new refugees come in,”she said. She and her husband, Zsigmond, came to the United States as refugees from Romania in the 1990s. Like most refugees, they started working manual labor. “My whole family worked in the potato factory,”she said. Szanto’s mother, a dentist, couldn’t practice in the United States. Her husband is now a veterinarian, and her mother became a dental assistant. But it took years, Szanto said. For those who do choose to pursue higher education, Twin Falls offers options through the college, though those courses don’t serve everyone. Pospichal recalled one couple who arrived in TwinFalls years ago. Both were practicing physicians in Iraq. While the wife decided not to pursue a medical career in the United States, the husband wanted to continue his career. That required tests and more medical courses, Pospichal said, which he couldn’t take in Idaho.The family eventually moved to California so he could complete his education — for the second time. Their move from Idaho comes at a critical period, as the state has a shortage of doctors. According to a 2011 study by the Association of American Medical Colleges, Idaho ranks second to last in the number of doctors per capita. In August, State Impact Idaho reported that there are only 2,873 physicians in the state. Had the Iraqi physician couple stayed here, that number may have gone up. “Who knows? They may come back in the future, they may not,”Pospichal said. Ghebrekidan hopes to someday return to Eritrea — after he receives his medical license, and, more importantly, after the violence dies down. Eritrea has a critical shortage of doctors, he said, and he’d like to help. Does he think the region will stabilize soon? If he can’t return to his country, he wants to set up a practice in Twin Falls, giving back to the community that has given him shelter. it is really good sing you have to passed the exams and become graduate and informative speech outline template available for students. Education is a powerful weapon of success. Happy to read about some good story from the Eritrea of Mulu Ghebrekidan who was worked as a physics and math teacher for six years in an Ethiopian refugee camp. So nice of him that in the critical situation of the second war he has given his best to other survival people by teaching them. Being as a business environment assignment assistance provider at Quality Dissertation and former teacher, I am so proud of such kind of people who do not forget their honesty. He has done great job by bringing his certificate long with him when he left his country, but felt bad to know universities in Eritrea don’t give graduates official copies of their diplomas unless they’ve completed five years of forced government service. If you have a diploma it means that you can find a great job. And this is really good. By the way, here is informative speech outline template. Students can use at any time. I have found out for myself that the dimplom may prevents a person from receiving certain types of federal financial aid available only to students who don't have degree. If you or some of your readers still need the help with writing an essay. Do not hesitate to follow the given link and check what these team of writes can do for you.